« Amenity Upgrade: Introducing Towne Motel’s New In-Room Keurig Coffee Makers! It’s official: the boutique hotel trend has jumped the shark. A boutique chain: now there’s an oxymoron. And a shark-jump. Food trends are a good example of the shark-jump phenomenon, whereby something is initially perceived as unique/exclusive and then, as its popularity spreads, takes a seemingly-inevitable downwards trajectory to end up, ingloriously, on a McDonald’s menu. Remember (this will reveal your age) when Caesar salads were considered gourmet, mixed tableside at fine restaurants? When balsamic vinegar was special? When salted caramel-whatever was a rarity? But this applies to other mass commodities too, sold as “experiences,” whether sneakers, sodas…or hotels. As David Brooks notes, the boutiqe hotel experience is all about difference and uniqueness, offering “edginess, art, emotion, and a dollop of pretension.” Boutique hotel guests, Brooks says, attract travelers who identify as discerning and for whom the hotels “hold up a flattering mirror…they are supposed to feel like they are entering an edgy community of unconventional, discerning people like themselves.” They want a “happening lobby scene” where they can bring their laptops and sit alongside other people with laptops or mobile devices. But wait, there’s more: Chip Conley, founder of Joie de Vivre boutique hotels in the Bay Area, claims that his top hotels offer “identity refreshment” and brings to their guests “an awareness of self-actualization.. When we stopped laughing, we started to imagine a boutique-makeover at Towne Motel. First order of business: to signal our new “brand” with a cooler, boutique-ish name. 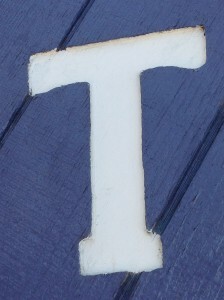 How about T? Or 68 Elm, like all those restaurants that use their street address in the name—another trend that may be about to jump the shark, if it hasn’t already. Then room makeovers with mid-century modern furniture. Breakfast room lighting: minimal, but you’ll be expected to wear sunglasses and bring mobile devices. Very happening. And—oh yeah–much more expensive. What Brooks describes, of course, is the urban version of boutique hotels. The boutique inns where we’ve stayed in Maine don’t have an edgy lobby scene, and the owners are friendly and welcoming. –The most affordable lodging option in the village of Camden, with bright, immaculately clean rooms, a homemade Continental breakfast, and a friendly and decidedly unpretetious vibe. –Towne Motel’s “no sticker-shock” prices mean that our guests have money left for fun stuff like great meals and shopping sprees in Camden. –Our guests don’t need Towne Motel to hold up a flattering mirror to them so that they can be re-affirmed in their edgy uniqueness. So what can we say? Boutique-schmootique! In fact, we think we have discovered a new lodging category. Come visit us at Towne Motel, the Un-Boutique! This entry was posted on Wednesday, January 15th, 2014 at 9:21 pm and is filed under Hospitality Trends. You can follow any responses to this entry through the RSS 2.0 feed. Both comments and pings are currently closed.